We know that the construction industry is responsible for a third of all carbon emissions globally. Add to that that the total construction output is expected to grow by 85% in 2030 and it becomes clear we cannot solve climate change without sustainable alternatives to how we build today. Insulation, new HVAC systems, and other energy efficiency measures in buildings have taken us quite some way in cutting energy use in buildings and subsequent GHG emissions. But the way forward for cutting the greenhouse gas emissions from buildings is not from efficiency in how we use buildings, it’s from transforming the way we build them. Today, more than two-thirds of the total GHG emissions caused by an office building over a period of 80 years comes from the construction phase. The choice of materials is the greatest source. This is where wood comes into the picture. Using wood as a construction material has the ability to counter that in two ways: First, it can substitute materials with greater GHG emissions such as – concrete, steel, and aluminum – and second, act as a carbon sink that ‘stores’ carbon for a long time inside of the building and potentially even afterwards if the wood is reused. This is why, we are proud partners of the report Wood in Construction: 25 cases of Nordic Good Practice, published by the Nordic Wood in Construction Secretariat and the Nordic Council of Ministers. The report gives the reader 25 examples of building in wood in the Nordics, each of them a testament to the fact that wood is a viable alternative to concrete, steel and many other materials with a high climate impact in our buildings. The Nordic countries have local access to the timber needed to build the wooden buildings of the future, and pairing the construction sector with sustainable forestry management, there is not only a great potential for the wood to act as a carbon sink and as such reduce carbon emissions, there is a slew of additional economic, social, and environmental co-benefits. Using wood as a building material often also has a number of health benefits, the major one being that it improves indoor air quality due to its moisture absorbing properties. It’s naturally also more environmentally friendly than its gray alternatives, as it embeds carbon in its structure. Finally, timber is both lightweight and often prefabricated, which enables fast construction time and money saved on transportation. The cases in the report show that the growing construction sector does not have to equal more pollution and carbon emissions – quite the contrary. Many projects showcased in the report became the tallest or the largest timber project of their type on completion. 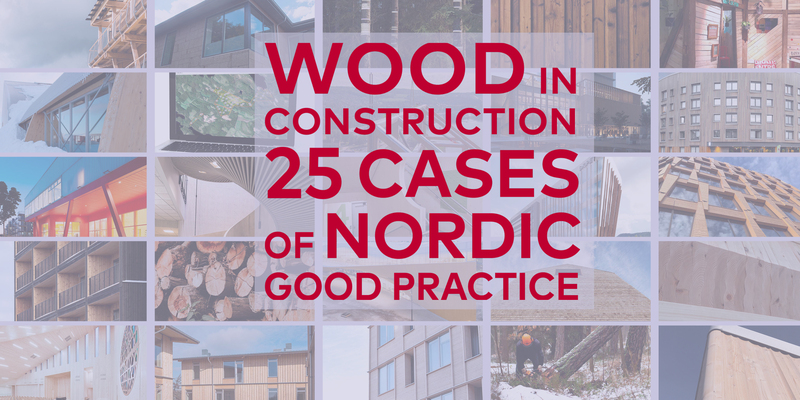 If you want to learn more of the benefits of using wood in construction and dive into the 25 good practice cases from around the Nordics, feel free to explore the full report.